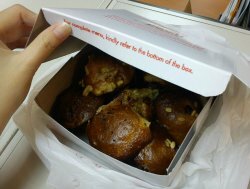 Who says Muffins have to be squeeze in pretty little cup, I tried the fantastic one without luxury gorgeous packaging. Uggli Muffins originally started up as a Zi Char stall, after that changed their concept to sell uniquely interesting Muffins. It was located at Wet Market Toa Payoh, walking distance to Braddell MRT. Baking oven visible at the stall, all Muffins were baked on the spot and freshly came out from stove. Ladyboss churned out as many Muffins as possible, while Boss took down patrons’ orders and paid attention for the timing of baking time. Their sentiment was perfect, busy producing quality Muffins without break. Extensive flavours as seen from picture, we were spoilt for choices. I opted for Chocolate, Muffin was fluffy and mixed with choco sprinkles. Surprisingly though, the soft and brown crispy crust was not very sweet. Another was Raisin and Orange Peel, slightly tangy with little sour hint surrounded. Simple yet still delicious, it was moist buttery fragrant. Muffins were shaped irregularly with quite even portion, price was 0.90 for each.